Time for another PTI blop hop! This month the challenge was to pull out our favourite floral set and combine that with a colour palette featured on Nichole’s blog. I’m afraid this isn’t my favourite floral set but my favourites don’t lend themselves to being stamped in multiple colours which is the second part of the challenge. I love larkspurs but it really works best in one colour and my other favourite is Sweet Life which could be stamped in multiple colours but I often find myself challenged to find three colours that work well to come up with one coordinated final blossom so trying to get them done in multiple colours seemed like too much work! It wasn’t until I started typing this that I thought about Life which would have been great, darn it! Oh well, this turned out really well even if it is CAS which isn’t my forte. 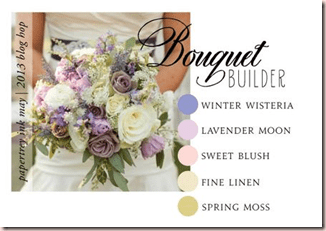 I personally don’t think of these colours as neutrals as referred to on Nichole’s blog, they are lovely pastels! I didn’t end up using the fine linen though. The layered die cut technique is from JJ Bolton’s blog, if I wasn’t typing this at 3;30 am I’d happily link it! She was featured at the CASE Study blog recently which is where I found the link so that might help you find it. I hope you enjoyed my card! If you’d like to see more of my work, be sure to visit again by subscribing by email, I have to get a new RSS feed thingie since I think mine is the type that is ending soon or bookmark me! Thanks so much for dropping by and have fun visiting some more blogs on the hop! Ink: wisteria, lavender, moss-PTI, pirouette, eggplant-SU! Accessories: tag die-Spellbinders, rhinestones-Dollarama, eyelet-WRMK, ribbon-Masterstroke ribbon, twine-Queen and Co, foam dots-Jody Morrow, eggplant marker-SU! Previous postHugs, You’ve Been Wonderful! Oh my heavens, Rebecca, brilliant!! Love the way you layered the tag – beautiful! Beautifully done! Great idea to overlay the tag and card images. Very lovely card. 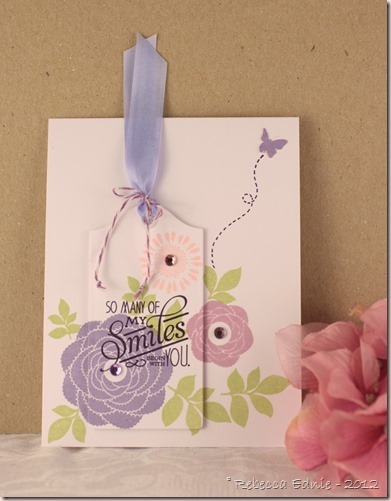 I love the pastel colors and the overlaying of the stamps with the tag – really a super layout. Love what you hv done with this set – beautiful! Just beautiful! You really captured the challenge pic. WOW, this is BEAUTIFUL! I love how you included a tg. So sweet! Great job on that layered tag…that takes some skill! 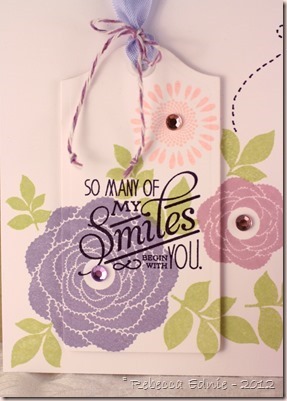 Love the layered stamping – sweet card! Love how the tag mimics the card! I love larkspurs too! Oh, this is so lovely! I love how you layered the tag with the stamps like that! I think it turned out beautiful.